Since we moved to our new location, we have been able to enjoy many new activities. 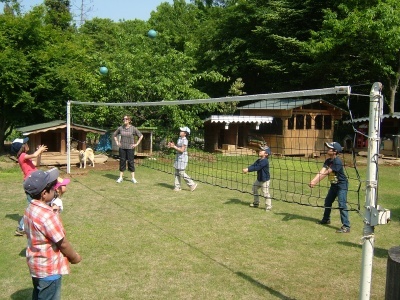 Last week, Mr. Kano installed volleyball net posts on the school grounds. When the concrete at the base of the posts dried, we finally got the go-ahead to use the new equipment. Mr. Kano put the net up for us and we started to learn how to receive (bump) the ball over the net. As you can see from the photo, even on our first day ever, we were getting some good height!